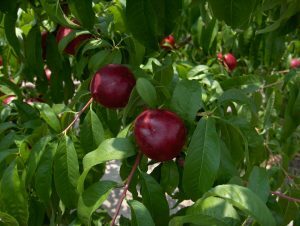 With the economic downswing many people who have never raised fruits or vegetables before are planting, hoping to reap the rewards of their time and labor. Traditionally, produce gardens were located away from the house, but as more Americans are pressed for time, edible landscaping, or incorporating food-producing plants into the landscape closer to the house, has made a comeback. Most gardeners think veggies first, but it’s easy to incorporate fruits and nuts into your landscape. A bonus – fruits and nuts offer multiple seasons of interest with spring blooms, summer fruit, attractive bark, and great fall foliage. In central North Carolina, there are a number of fruits that can be integrated into the landscape. 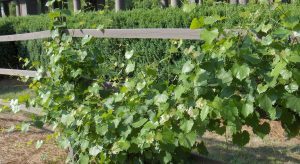 Strawberry (Fragaria x ananassa) can be used as a low-growing groundcover, muscadine grapes (Vitis rotundifolia) could be grown on arbors or fences, and apples (Malus spp.) can be substituted for spring-blooming ornamental trees. Other favorites are blueberries and blackberries – unfortunately raspberries are not adapted to North Carolina. Blueberries provide year-round beauty, spring blossoms and great fall color, plus the yummy berries. 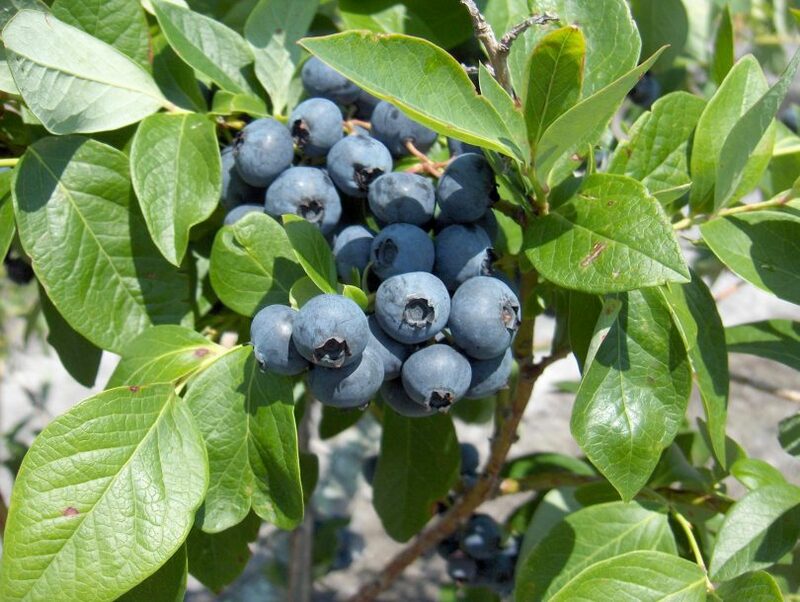 There are two types of blueberries that can be planted here: Southern highbush (Vaccinium corymbosum) and rabbiteye (V. ashei). Rabbiteye is native to the South and highly adapted to growing conditions here; both types require an acidic pH to thrive. Blackberries rival the blueberry in health benefits, and they can tolerate the Southern heat. Unless you want a thorny hedge, stick with thornless varieties. A nice cultivar is ‘Navaho’ since the berries hold well in the refrigerator. If you have lots of space, add nut trees. Pecan (Carya illinoinensis) is a familiar nut tree in North Carolina. Though they grow best in the Coastal Plains and eastern edge of the Piedmont, you can plant them in the Triangle. Just be careful where you plant since they can become dangerous in hurricanes! Black walnuts (Juglans nigra) and hickory (Carya spp.) also produce nuts. Edible plants do best with at least 6 hours of full sun per day; however some will tolerate more shade. You will also want a well-drained soil and the proper location for the plant. This “right plant, right place” concept will cut down on water, disease and insect problems, and time you need to invest in the garden. Incorporating fruits and nuts into your landscape creates a delectable, beautiful garden. Plus you can have a snack while you are out working in the garden! Stephanie Romelczyk is a Horticulture Agent.